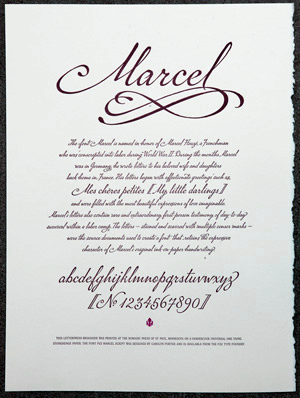 This letterpress poster has been produced to accompany the release of the Marcel Script font by Carolyn Porter. This specimen features a deep letterpress impression in 2 colors on ivory heavyweight Stonehenge paper with a deckle on the right side. THIS LETTERPRESS BROADSIDE WAS PRINTED AT THE NOMADIC PRESS OF ST. PAUL MINNESOTA ON A VANDERCOOK UNIVERSAL ONE USING STONEHENGE PAPER. 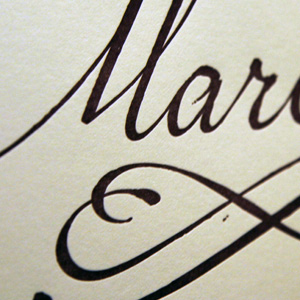 THE FONT P22 MARCEL SCRIPT WAS DESIGNED BY CAROLYN PORTER AND IS AVAILABLE FROM THE P22 TYPE FOUNDRY.